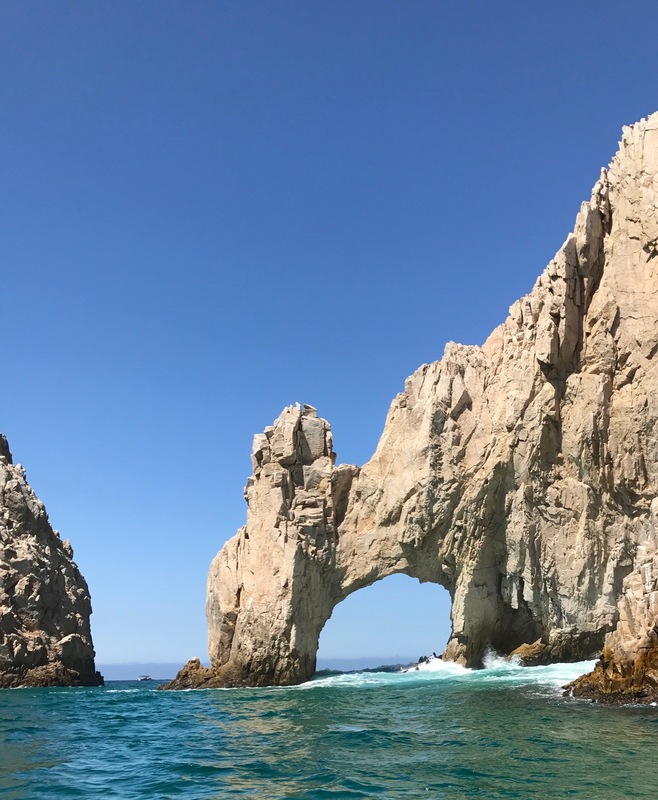 Our family recently returned from a well-deserved trip to Cabo San Lucas, where they boast Happiness is Here! on all their promotional literature. Well, for us, this is true, we really loved Cabo and plan to return. First, I want to make it clear that we didn't get anything free on this vacation, so this review isn't being paid by anyone. All my comments and reviews are my own, and not even the same as all members of my family. Resort: We stayed at Villa Del Palmar, in Cabo's Golden Corridor, a 20 mile stretch between Cabo San Lucas and San Jose. Villa Del Palmar was suggested by Interval International, a brokerage for time share resorts across the world. 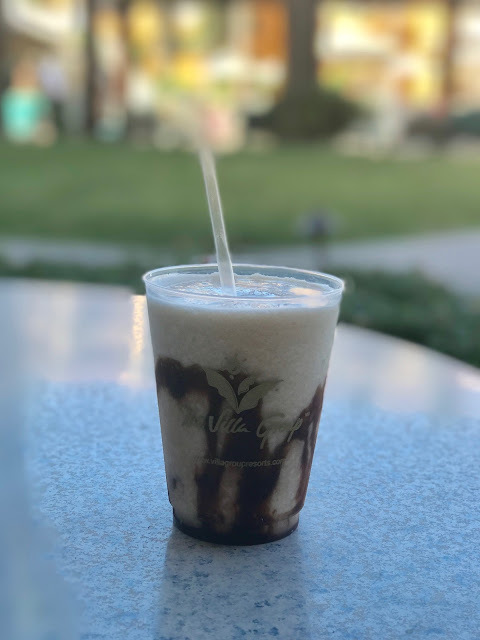 We chose it from many due to the recommendations of the members of our own timeshare, Welk Resorts, and I have to admit that many of the members were correct. The resort itself is lovely but maybe a bit outdated, but everything we encountered was neat and clean. The staff worked hard to keep the premises beautiful. The pool area is rather small but the Sea of Cortez is right in front of you! The resort is a part of two other resorts which makes it feel larger. Beach: The beach in front of the resort was red flagged every day we were there due to high winds and unsafe conditions. The sand is super soft and difficult to walk in. We walked it twice, once to go on a boat ride and the second to get photos taken. 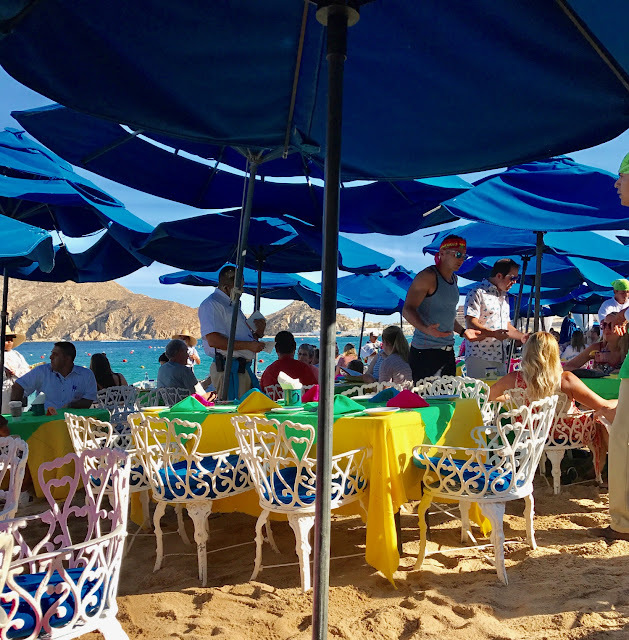 Restaurants: The food scene in Cabo is outstanding. Our splurge events included Flora Farms and Cocina Del Mar at Esperanza Resort. 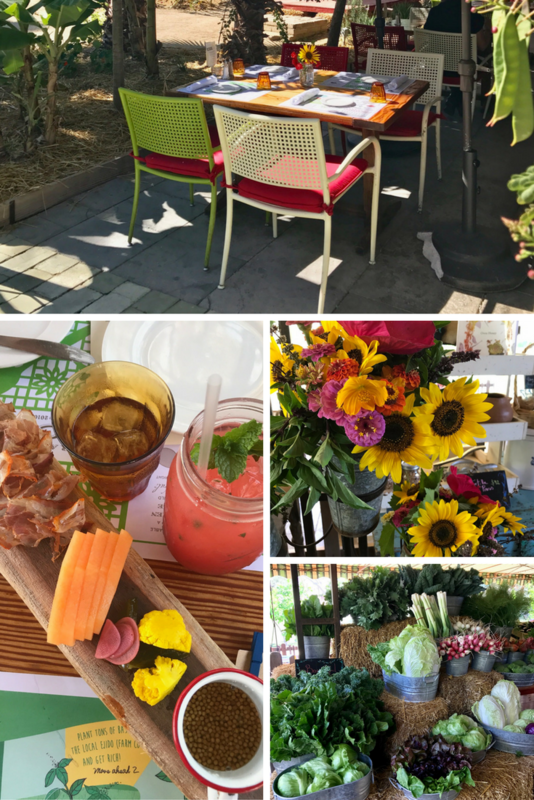 Flora Farms is a farm-to-table restaurant and much more. The farms supply food for the restaurant, plus goods for the local market. The grounds include shopping and you can see the farmers in the fields working. The food was amazing, as were all the drinks. Our daughter and son-in-law experienced Cocina Del Mar before we arrived and gave the restaurant a thumbs up. Our less expensive splurges included the Hacienda Cocina Y Cantina and The Office. We loved both, both had delightful Mexican cuisine, which we all love. The view from Hacienda was wonderful and that night we were "treated" to the view of bat mantas jumping from the sea and belly flopping on the water. So exciting! The Office is decorated beautifully, had strolling musicians and delightful food. We also experienced the "all inclusive" at Villa Del Palmar, eating at Bella California, Neptune and El Patron. Bella California was Italian and California fusion and was very good, especially the pizzas and lasagne. Neptune was a delicious seafood restaurant and where we chose to celebrate my husband's 59th birthday! El Patron had wonderful Mexican cuisine, with a playful and creative menu. Excursions: We chose to stay close to the resort on most days but we did three excursions that we loved. 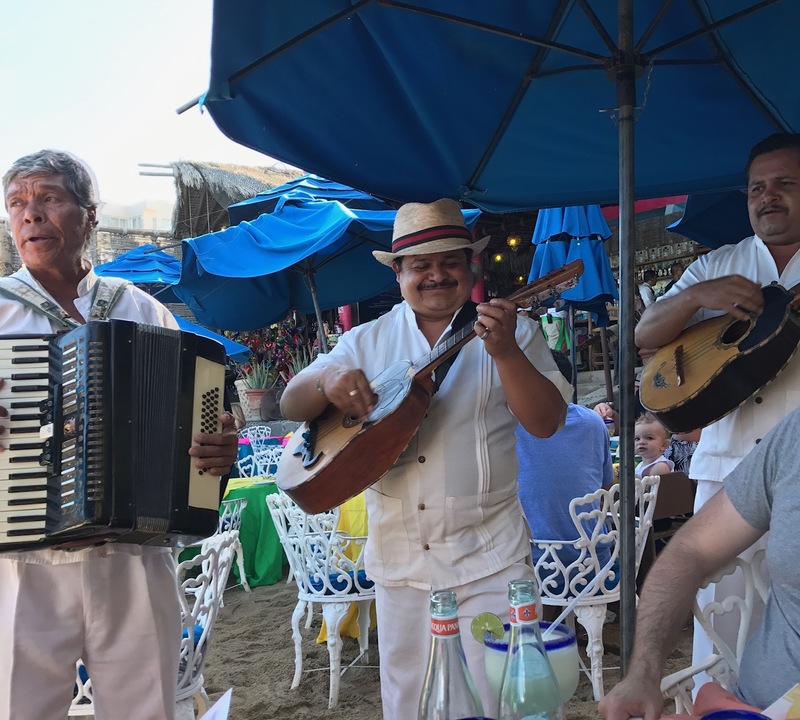 The first was to Todos Santos, the home of Hotel California (think Eagles hit song) but learned that there is truly no connection between the two. However, singing, "on a dark desert highway" on the way there and seeing the mission only steps away makes me wonder... the second excursion was a boat ride to see El Arco, Lover's Beach and Divorce Beach up close and again, a wonderful trip! It was a wild, windy day so we couldn't go to the Beach but I loved each and every minute of that trip! 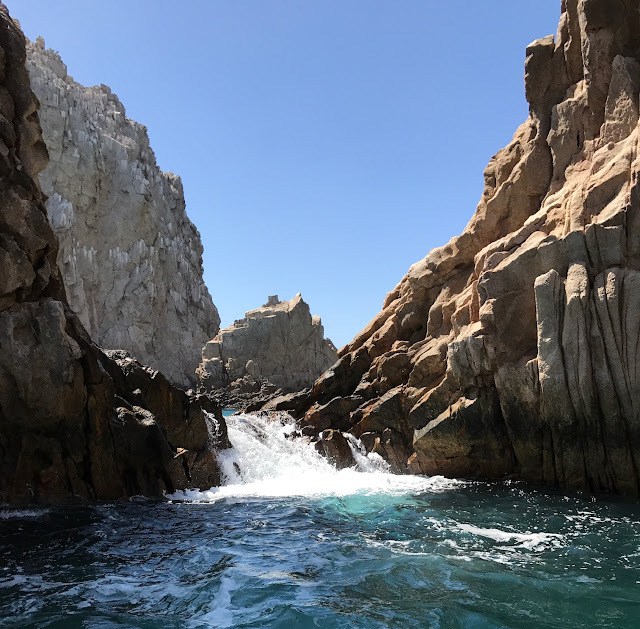 We explored Cabo for an afternoon, walking through the marina, sipping margaritas at Cabo Wabo and buying cuban cigars for my husband! Favorites: Chilaquilas is our favorite breakfast food! It is day old corn tortillas, sliced, soaked into verde sauce or rojo sauce, fried, then topped with cheese, red onion and sometimes chicken. 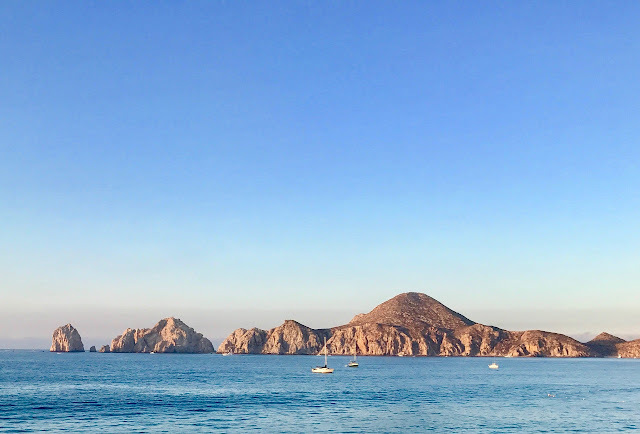 We loved watching the sea life in the Sea of Cortez. We saw bat mantas, sea lions, birds of all kinds, and several types of fish. My daughter and I love the Brown Monkey cocktail, something with banana and chocolate. That's all we know. 1. Plan to leave a little time to shop at the airport. We found some pretty good deals on souvenirs. 2. Make sure you pre-book your transportation back to the airport. 3. Take lots of one dollar bills. You feel like you are constantly tipping someone. Be prepared! 4. Shorts, cute tees, sundresses, sandals, swimsuit and flip flops and you've covered all the bases! 5. Drink bottled water, but the water in Cabo is safe. It goes through a purification system unlike the rest of Mexico, but be on the safe side. All the restaurants we were at offered bottled water to us as we sat down. We didn't do a lot of nightlife, as we are pretty laid back people. Our goal for the next trip is to explore San Jose del Cabo and to stay at a different resort. We have a list of restaurants we didn't get to and I plan to learn to make chilaquilas at home! If you are big Cabo people, please let us know your favorites!